So as I mentioned, there's not really anything in the newspaper from 1922 regarding the 10th anniversary of Arizona's statehood. But there's plenty from February 1912, statehood day! Hon. 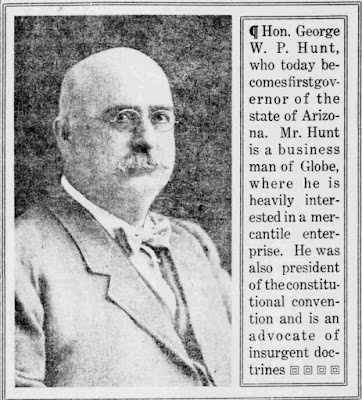 George W. P. Hunt Takes Oath of Office as First Governor of the Newly Created State of Arizona. In the Presence of Several Hundred Spectators Gila Man Was Inducted Into Office at the Capitol at Noon Yesterday. 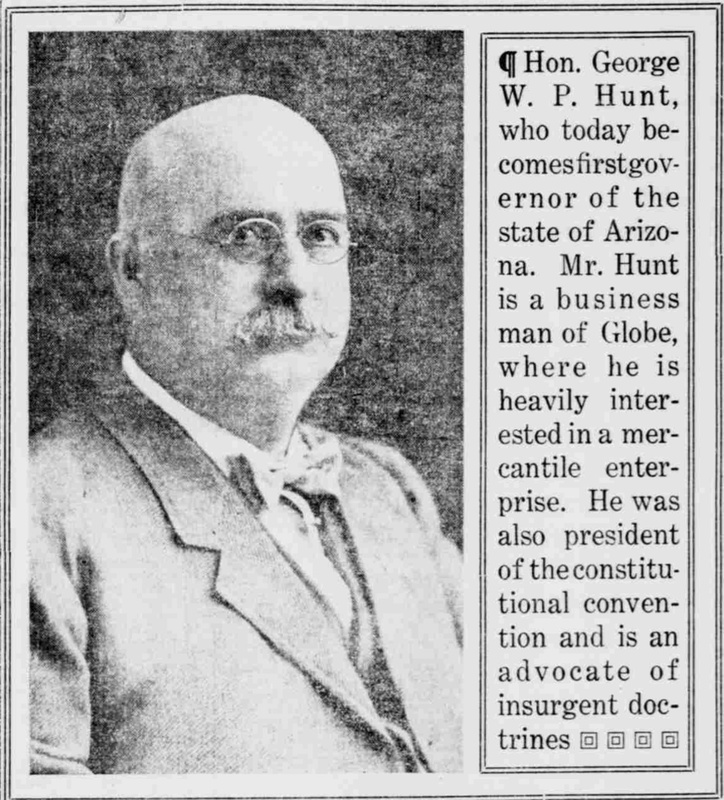 With the ceremony so timed that the assent to the oath came a few seconds before 12 o'clock, George William Paul Hunt, standing on the portico of the capitol building, yesterday assumed the responsibility of the first governor of Arizona. The oath was administered by Chief Justice Alfred Franklin, in the presence of the retiring territorial officials, the incoming officers of the state, a host of personal friends, a vast assemblage of the men and women of the territory who covered the lawns in front of the building, and William Jennings Bryan who was holding an impromptu reception on one of them. Immediately after the inauguration the governor took his station in the executive chambers with Mr. Bryan on his right hand and the two gentlemen received and shook hands with hundreds who filed through the building to welcome one, the state's first choice for governor, and the other the world's most famous "commoner", of democratic faith and holding principles much in accord with the governor. Simplicity and modest ceremonials were the keynote of the event, in strict accordance with the wishes of the new governor who holds that as a matter of principle the higher the official, the nearer he should place himself on the common level in al (sic) affairs of state…. Panoramic Procession of Admission Day Events Evokes Enthusiasm of People. Merrymaking Extended Far Into Night and Closed with Inaugural Ball Held on Streets. The forty-eight star has been planted in the blue field of Old Glory. More with complacency than with enthusiasm Phoenix celebrated the event. The city was crowded, to be sure; hundreds came long distances to see the governor take the oath of office and to shake his hand at the evening reception. But it was not a boisterous, din-creating crowd. The spirt was there, true enough, but it took the form of contentment rather than a glad frenzy. Attorney General Bullard and Sharlot Hall Address Students On Duty of Future and History of the Past. Attorney General George Purdy Bullard and Miss Sharlot Hall tore themselves away from the statehood celebration in Phoenix long enough to address the students of the Normal school at Tempe, and take to the south side metropolis something of the spirit of the day which found more complete expression at the capital. The talks were listened to by an audience of more than a hundred highly appreciative of the privilege. THe attorney general spoke of the "Responsibilities of Statehood," and eloquently discussed the important part to be played by the boys and girls in such development. Miss Hall discussed the history of Arizona, and as no one is more competent to handle so interesting and diverting a subject her talk was most timely…. The "normal" or teaching school they are referring to is now known as Arizona State University, by the way. WASHINGTON, Feb. 12.--For the first time in the history of the White House, moving pictures of an event of national importance will be taken tomorrow when President Taft signs the proclamation admitting Arizona to statehood. The pictures will be taken by an employe of the treasury department and will be presented to the president. Another set may be made part of the official record. I could not find a video online of the signing, though other articles said as many as 3 films were made. This is the day of days for Arizona. Today the hopes of years, the aspirations of more than a quarter century find their fruition in statehood. Today the buds of hope burst into full flower of realization. Today the sovereignty of more than two hundred thousand people is proclaimed. Today Arizona, the last of the continental states, steps into the union and thus completes the ocean-to-ocean chain of sovereign commonwealth…. Arizona embarks on the sea of statehood under clear skies. Though storms are sure to come this newspaper has absolute faith in the integrity and capacity of the people to take care of themselves and of the state in any contingency that may arise. The Republican rejoices with every man, woman, and child in this state on the admission of Arizona into the American union. The Arizona Sentinel and Yuma Weekly Examiner, Bisbee Daily Review, and Weekly Journal-Miner of Prescott also reported the news. Here's a little video I found on YouTube…the last minute or so tells an amusing story that I think sums up Arizona's politics pretty nicely.